Chuna Manual Therapy may be an unfamiliar term to some. If you haven’t heard of it yet, Chuna is a traditional Korean Medicine manipulation procedure applied to restore function and structural balance, especially to the musculoskeletal system, and thus treat various physiological and pathological conditions using a non-invasive approach. Chuna Manual Therapy is set to be covered by Korean National Health Insurance (NHI) as of March 2019, which has brought it to the center of public attention recently. To get a better sense of Korean Chuna, we interviewed Dr. Joon-Shik Shin, the Korean Medicine doctor who originated and developed Korean Chuna based on the traditional approach recorded in ancient textbooks and standardized it to its current form of modern Chuna Manual Medicine, and invited him to answer our most frequently asked questions. 1. What is Chuna Therapy? Chuna Manual Therapy is a manipulative treatment method used for a wide variety of musculoskeletal disorders including lumbar and cervical disc problems and spinal stenosis. Chuna involves manual stimulation applied to the meridian system to correct malalignment and dysfunctions of the musculoskeletal system, thereby relieving pain and restoring normal physiological function. 2. Can I receive health insurance benefits for Chuna at Jaseng Hospital of Korean Medicine? Of course! You can receive standardized Chuna treatment with health insurance benefits at any of the 21 Jaseng branches located throughout South Korea. Musculoskeletal disorders such as spinal disc problems usually require continuous treatment for sustained treatment effects due to the structural and habitual life-style component of the disease. When national insurance coverage of Chuna is implemented in March 2019, it is expected to reduce the financial burden of Chuna treatment to half its current price. 3. What are the main indications of Korean Chuna treatment? The most common disease that requires Chuna Manual Therapy is lumbar disc herniation. By correcting dysfunctions and malalignment of the joints, muscles, and spine, Chuna therapy reduces the pressure load on the intervertebral discs and surrounding tissue, which helps reduce pain caused by nerve root compression. It is also effective for musculoskeletal disorders such as cervical disc problems, spinal stenosis, neuropathy, back·neck·shoulder pain, knee arthritis, tennis elbow, and various other joint conditions including sprains and dislocations. Chuna therapy can be applied to a wide variety of musculoskeletal disorders and medical conditions. However, it may not be the only or most effective treatment option for that disorder or your symptoms, so it is recommended to receive examination and consultation with a licensed Korean Medicine doctor prior to Chuna treatment to be provided with a personal treatment and management plan appropriately tailored to your individual needs and symptoms. 4. How are musculoskeletal disorders treated with Chuna Therapy? The purpose of Chuna therapy is not simple correction. Its aim is to restore normal function to dysfunctional organ systems through the recovery of positional and structural balance. When our bones and joints are displaced from their normal position and become dysfunctional, the soft tissue surrounding the bones, ligaments and nerves, and fascia become congested and swell up. Muscles and ligaments also remain tense for prolonged periods of time in an attempt to return the bones to their original position, which leads to muscle soreness, further blood circulation anomalies and congestion, and pain. When the bones and joints are returned to their normal position, the bones, joints, and surrounding tissue regain normal function and movement, and thus the initial pain can be resolved. Korean Chuna therapy dates back more than 200 years. Its effects have been clinically and empirically proven over the course of many years, and I have worked hard for over 20 years to create a standardized manual therapy that can effectively treat back pain. Based on the traditional approach to Chuna therapy, I continued my research and studies in search of more effective methods to heighten its efficacy, and clinically applied them to verify their effects and safety. 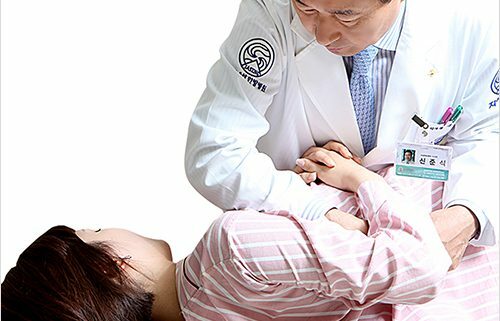 The specific techniques and method of Chuna therapy were further solidified in the 1990s with the establishment of the Korean Society of Chuna Manual Medicine for Spine & Nerves in 1991. Jaseng has published over 200 academic research papers on the effects of Chuna therapy and various studies were conducted to determine its effects. For example, we conducted a clinical study on the effects of integrative Korean Medicine treatment focused on Chuna manual therapy in patients with lumbar disc herniation. The long-term treatment effects were shown to be maintained even after 5 years. 5. What should I be aware of when receiving Chuna therapy? Chuna manual therapy is a Korean Medicine treatment that can only be administered by licensed Korean Medicine doctors (KMDs). It is because patients are treated holistically with Korean Medicine through systematic evaluation and diagnosis of the whole body that Chuna therapy can be applied safely with good treatment effects. For this reason, it is imperative that you receive Chuna treatment at a certified Korean Medicine medical institution. All physicians at Jaseng Hospital of Korean Medicine are trained and have completed the full Chuna workshop course at the Korean Society of Chuna Manual Medicine for Spine & Nerves in addition to partaking in Jaseng’s continuing medical education courses in order to provide safe and effective treatment to our patients.